The fourth in a series designed to introduce young students to the Bible, Telling God’s Story, Year Four shows how Jesus’ mission continues in the words and deeds of his very first followers…and in our own lives. Listen to the stories of Jesus’ first followers. Learn about the way of life he gave to us. And see what it looks like to live in the new community he is creating. These weekly lessons guide elementary students through the Book of Acts and the New Testament Letters, while also deepening the understanding of parents and teachers. Each lesson provides pithy, content-filled background information for the teacher and a scripted explanation of the biblical passage designed especially for children to grasp with ease. When combined with the Activity Book, this curriculum provides a whole school-year of religious instruction. 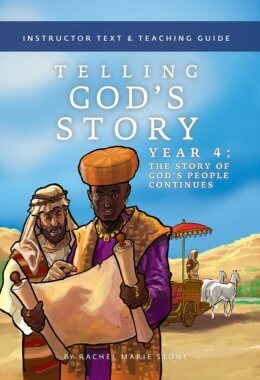 This fourth volume of the Telling God’s Story series completes the student’s introduction to the New Testament.